A more affordable and compact version of the PHII. Designed for sailboats and mid-sized powerboats without sacrificing durability. 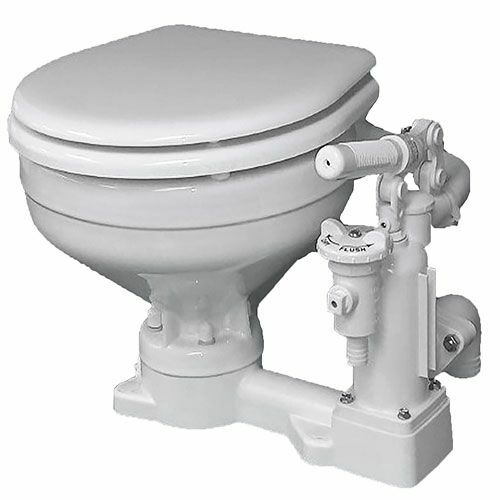 The Raritan PH Superflush Compact Manual Head is the latest release of the world renowned PH manual toilet and is now backed with an industry BEST in class 3 year warranty. Clearing the compact size ceramic bowl with less strokes is quick, easy and efficient thanks to their robust double-action piston pump that is 66% larger than the competition. All units come standard with a slow close seat and feature integrated chocks to keep the seat stable while the boat is rocking. Features a telescopic handle that can be extended for full leverage and tucks away after use to conserve space. Pump material is made of a durable engineered thermoplastic making it one of the most durable units on the market today. All units have a dry flush option and may be installed above or below the waterline. Manual piston pump is also field reversible for left hand operation if needed. 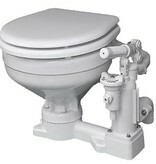 Their mounting footprint matches many competitive model heads making the Raritan PH Superflush an ideal upgrade option. All units are manufactured and individually water tested in the USA.